I can hardly believe Easter is this Sunday! I know it is also late this year, but still. Didn’t I just put my Christmas tree away? It is hard to ignore how beautiful Spring is in Los Angeles thanks to the rain we had this Winter. The hillsides are all a deep green with bright sprays of flowers. My own balcony garden is also BOOMING and I am tickled every morning when I open my door and check on my little plant babies. As an ode to Spring and Easter this week, I am excited to share with you a really fun recipe for carrot cake cookies! I absolutely love carrot cake, but I wanted to make something that was easier, didn’t require frosting, and was portable enough to bring to any Spring gathering. 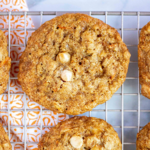 These white chocolate carrot cake cookies combine all of the BEST carrot cake flavors, in a delicious buttery and lacey cookie. 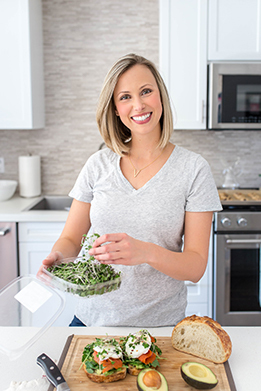 Questions I often get asked are about equipment and what is needed versus what is essential in a home kitchen. It is my absolute dream to have a stand mixer, but my Los Angeles apartment doesn’t have the counter space for it, so my dream will have to wait. None of my recipes therefore ever call out, “Use your stand mixer to…” I do everything either by hand with a whisk or I pull out my trusty hand mixer. It works beautifully for most recipes and takes up much less space. 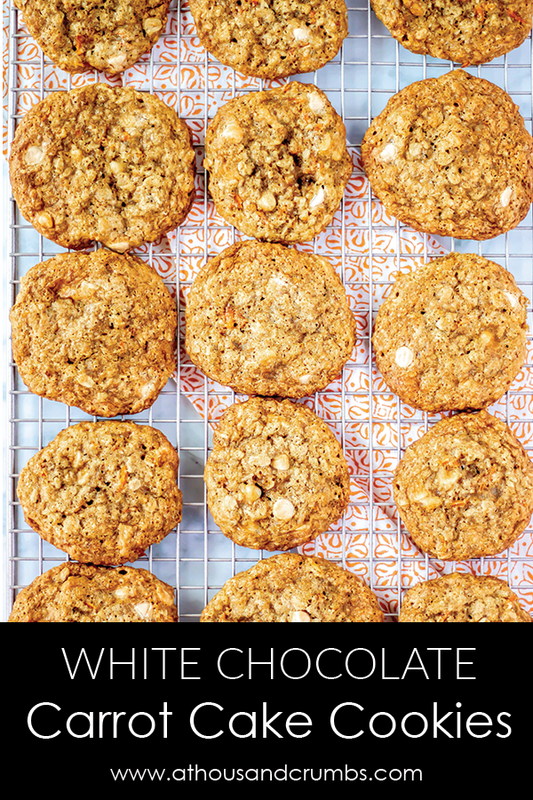 To keep these cookies nice and hearty, I used old fashioned rolled oats. Shredded coconut also adds the perfect touch of sweetness, and a nice complement to the chopped walnuts. Rather than cream cheese, I used white chocolate chips to round out that carrot cake flavor profile. 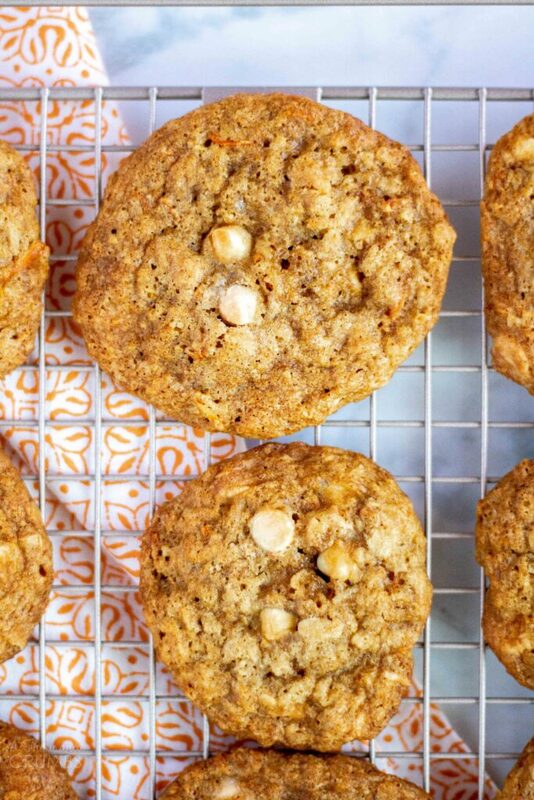 If you’re looking for a Springy recipe to get you in the mood for Easter, roll up your sleeves and make a batch of these carrot cake cookies. I promise, you will be hopping with joy once you try them! 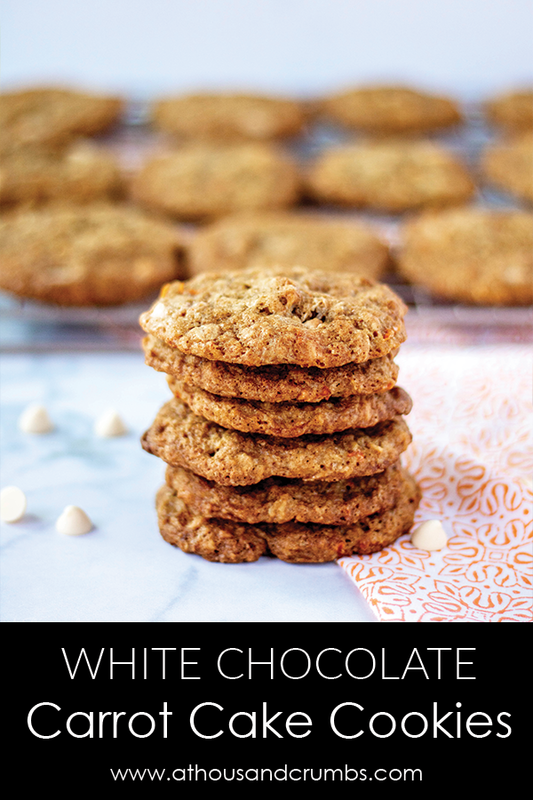 All the flavors you love about carrot cake, in a convenient cookie, studded with white chocolate chips. Preheat oven to 350F degrees, and line a baking sheet with parchment. Set aside. In a large bowl, beat together the butter and sugars until light and fluffy, about 2 minutes. Add the eggs, one at a time, until incorporated, then add vanilla. In a separate bowl, whisk together flour, baking soda, baking powder, cinnamon, nutmeg, and salt. Add dry ingredients to butter mixture until well-combined. Stir in carrots, coconut, walnuts, white chocolate chips, oats, and mix until just combined. Scoop rounded tablespoonfuls of dough onto baking sheet. Bake until golden, 12-15 minutes. Let cool on sheet for 5 minutes before transferring to a wire rack to cool completely. I like to refrigerate or freeze my dough for 30 minutes before baking to minimize spreading.